​The format of her classes includes centering, pranayama practice (conscious breathing), warming up the joints and then moving into the more traditional asanas (postures) and vinyasas (posture flows). Classes end with a brief seated meditation, followed by shavasana, the pose of deep relaxation. Within this format, each class is somewhat different Inspiring music of all types helps to set the mood. ​“Private classes are so important initially not only to learn how to do each posture the correct way but also learning and practicing deep yoga breathing throughout the class. I have gained so much more strength and flexibility through Angelena’s tutoring”. ​ "I love Angelena's classes and the way she teaches. She uses the power of example to show me how to age wonderfully." For anyone who knows yoga would be good for them but can not easily get up and down off of the floor, or who have endurance issues, these classes offer the same benefits of a regular yoga class but are done (mostly or totally) seated and when standing, using the chair for support. Angelena first began teaching chair classes 20 years ago and has refined her program, over the years. 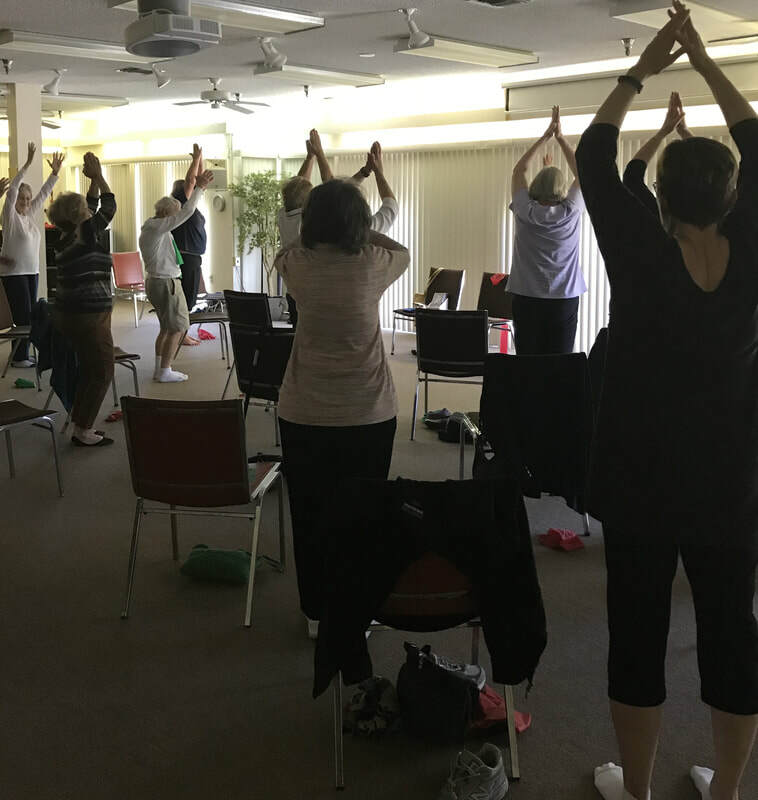 “Our Chair Yoga class was as wonderful as it has been for the last four years. We all feel so relaxed and stretched out afterward and you create a calm enjoyable atmosphere." "The atmosphere of the class is very relaxed. Angelena is understanding of our needs, is always prepared and gives explanations for our movements... and she adds in humor." Yoga classes are held at your home, office or in Angelena's home studio located in Sarasota, Florida . You don't enjoy group classes and want to learn yoga from the beginning. You have a chronic condition or injury and you want to focus on a particular area. You need to quickly learn and practice the tools of stress reduction. You can't seem to match your schedule with any group classes offered, and you need more flexibility week-to-week. You want to learn how to practice yoga while using a chair for support (teaching chair yoga is one of Angelena's specialties). ​ “Private classes are so important initially not only to learn how to do each posture the correct way but also learning and practicing deep yoga breathing throughout the class. I have gained so much more strength and flexibility through Angelena’s tutoring”. Each morning a 75 minute Kripalu Yoga class will wake you up, energize you and put you in a great frame of mind to enjoy the entire day. Angelena's style is a slow flow, done to inspiring music, which will release the tensions, open the joints, and help to build more strength, flexibility and balance. We start becoming centered, practicing a bit of pranayama (conscious breathing) and then systematically warming the entire body in preparation for the more traditional asanas and vinyasas. The student is asked to honor their own strengths and any limitations while he focus is on the flow of energy... rather than holding poses for a long time. The class is gentle yet energizing. ​All levels, ages and fitness levels are welcome ;only a willingness to fully participate is required. "Angelena is a very creative teacher. Although her classes don't feel particularly strenuous, I felt really strong and limber after each one. I highly recommend you take a class or a series of classes with her." The newest addition to Angelena's offering, these classes are an extension of Chair Yoga and include stretch bands for strengthening and repetitive dance moves which improve coordination and add FUN to the class as well as opportunities to practice balancing. 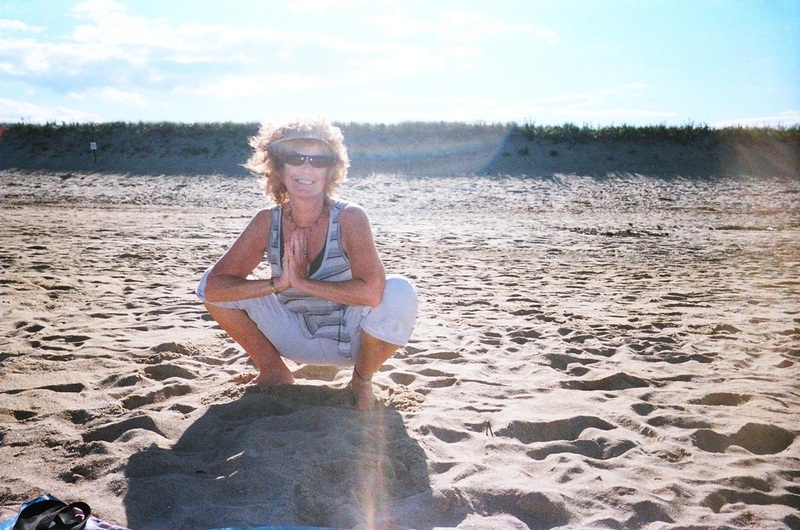 "I am in my 60s and I have been very athletic all but life but I never tried Yoga. I have heard often about t benefits but never took the plunge. People I know have said it is great for flexibility, preventing injury and overall health. Since I m a private person I opted for private lessons which have far exceeded my expectations. I go at my own pace which is perfect. The lessons have been exceptional which is due to my teacher and I think the Power of Yoga. I feel better, more energy and certainly have improved my flexibility. One big surprise for an athletic guy like myself is how much stronger I feel after a class. I unconditionally recommend Yoga with Angelena who is an expert in Yoga and instructional skills. " Contact Angelena at 941-822-9620 to purchase a gift certificate in any amount.